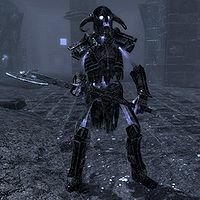 Wrathmen are draugr-like skeletal undead found in the Soul Cairn. Compared to the other Soul Cairn enemies such as the bonemen and mistmen, wrathmen are much more warrior-like, wearing non-lootable ancient Nord armor and wielding leveled two-handed weaponry. The Conjuration spell tome Conjure Wrathman can be found in the Soul Cairn, which summons a two-handed dragonbone weapon-wielding wrathman for 60 seconds. Wrathmen have the highest health of any summoned creature.